Hoffman 1-Door enclosure has continuously welded ground smooth seam for neat appeal. It features rolled lip around three sides of door, stainless steel door clamp assembly and seamless foam-in-place gasket. Hasp-and-staple of this enclosure allows padlocking. It measures 12-Inch x 16-Inch x 6-Inch. Remove the door of enclosure by simply pulling stainless steel continuous hinge pin. Enclosure has type 304 stainless steel construction with brushed smooth finish. It includes high-impact thermoplastic data pocket. Collar studs allow mounting optional panels. It is suitable for Indoor and outdoor corrosive environments that require water-tight seal. 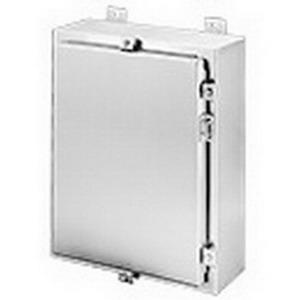 Wall mount enclosure is UL listed, cUL listed, NEMA/EEMAC certified and meets IEC standards.